The Unthanks – sisters Becky and Rachel – have, over the last decade, become major figures on the English folk scene. Strong on tradition they have also forged new musical paths and travelled along many sidetracks. This latest release is one of the sidetracks,which also sees the sisters forging a connection to the mainstream. In 2013 a series of home recordings of the songs and poems of Molly Drake – mother of the highly regarded Nick – emerged, and The Unthanks have developed these both for these new recordings and also as a live show. Both feature the voice of Molly’s daughter – actress Gabrielle Drake – adding renditions of poems, some standing alone others blended into the songs. It’s an interesting collection – and of course it only exists because of the continued and growing interest in Nick Drake; there’s a temptation to try and draw a direct connection back from his own style of pastorally melancholic songs to the poetry and songs of his mother. The restrained piano arrangements and the haunting breathing of the clarinet drifting through this album can’t help but strengthen this notion of an entwined poetic muse. To be of lasting interest beyond this acting in the role of an early influence on Nick Drake the songs of Molly Drake need to be judged on their own merit – The Unthanks have clearly fallen hook line and sinker for them. Some of the songs have a haunting quality, in the hands of The Unthanks they drift into a strange half-imaginary folk world. There’s an eerie, unearthly, feel to How Wild the Wind Blows which conjoins the great extent of nature with the tiny self of a growing child or a germinating seed, “The acorn carries an oak tree sleeping but for a little while / Winter lies in the arms of Spring as a mother carries her child”. Woods in May captures a desolate mood of repressed desires and untold secrets, in its brevity it conveys an almost unbearable sense of loss and unfulfilled wishes – it’s all ifs and maybes without resolution. Many of the other songs dwell on a dwindling love, and a disappointment at the lack of mutual empathy. I remember uses a light-hearted touch to convey conflicting personalities which never blended into a longed for enraptured singularity. Hidden within it is a painful realisation of the impossibility of such a dream of perfect love. Never pine for the old love fails to take its own advice, it’s full of wistful regret even as it admonishes “never pine for the old love / go out and find the new”. Those who are searching for insight into the familial connections will find it in Soft Shelled Crabs – a song only recalled by Gabrielle Drake from her mother’s singing and thus collected in the properly defined folk tradition way. It’s a whimsical little song, with an almost Flanders and Swann feel to it. Ostensibly about molluscs it’s easy to interpret it as a description of over-sensitivity, and to imagine it being sung to an emotionally gentle little boy “we fear the day too much / and incidentally bruise at the slightest touch so treat us gently / … / we feel the world’s hard jabs we soft shelled crabs”. Or maybe it was just an amusement. The sense of overthinking nervousness is also conveyed in poems such as Bird in the Blue which dwells on bleak night thoughts. At other times the poems, and some of the songs, have a stilted feel to them – the slightly arch and too deliberately clever writing of someone who picked up their influences as they came of age in a comfortable upper middle class world in the roaring thirties. These songs and poems, though, were never intended to be heard widely – written only for personal consumption – some shared with family and friends but mostly, it seems, an extension of an inner world, laid out on paper. They need to be heard with this in mind, as it is this which really makes them of interest. 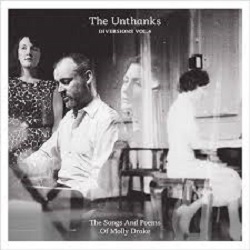 The Unthanks travel the path less trodden, once again, in this emotionally restrained collection of songs by Molly Drake, mother of the better known Nick.